About a year ago I was scheduled to make a video of a lumbar puncture on a child with Hodgkin’s lymphoma. The purpose of the video was to demonstrate the procedure and show the specifics of puncturing children. I was going to shoot an actual puncture, so we had to get the parents’ consent to me being present with my camera. The problem was, lumbar puncture is a diagnostic procedure, so we’d have to ask the parents of a child with recently discovered disease. Fortunately I didn’t have to ask myself, and the nurse who did it did not feel comfortable asking parents who’s life has been turned upside down if we could film their child. Naturally most of the parents we asked declined. But then we found this 5-year-old boy. Arriving at the children’s ward I expected to see a treatment weary child with all the usual tubes and needles. But bald from chemotherapy this boy was running around all excited. His mother told us he’d been looking forward to the lumbar puncture all day. 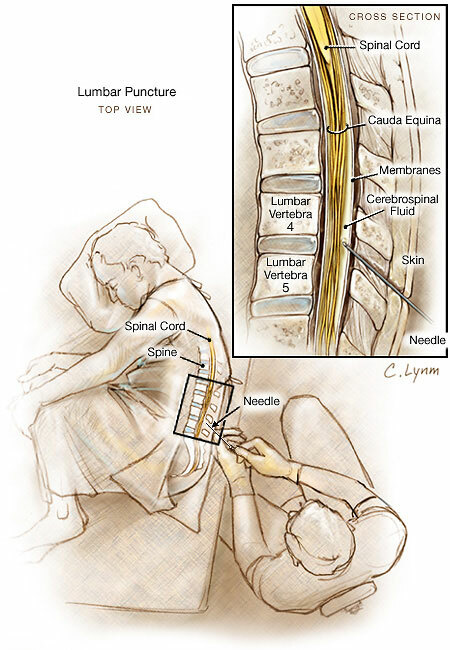 Lumbar puncture is performed by inserting a needle between the lumbar vertebrae and past the dura mater (see figure). Withdrawing the stylet from the needle, drops of CSF are collected for diagnostic purposes. In the case of this boy the doctor was also going to inject a cytotoxic drug into the central canal of his spinal cord. Lumbar puncture on children is always done under general anesthesia, to block the pain and relax the body. Before anesthesia the patient always has to go through four hours of fasting. So with all this in store, why was the boy excited? When it was the boy’s turn he ran into the room, jumped onto the table and was soon unconscious. One of the nurses then told me that a lot of children enjoys being anesthetized. Some even urges the anesthesiologist to give it to them quickly to get a “rush”. It’s both funny and a bit sad that a lumbar puncture is a bright spot in this 5-year-old boy’s life. It’s a positive thing that he could turn something possibly traumatic into something to look forward to. But it’s devastating to think that a child’s life can be so full of medical treatment and tests that he’s longing for the peace and quiet of narcosis. Picture credit: JAMA. 2006;296:2050. © American Medical Association. You are currently reading Bright spot puncture at The Sterile Eye.